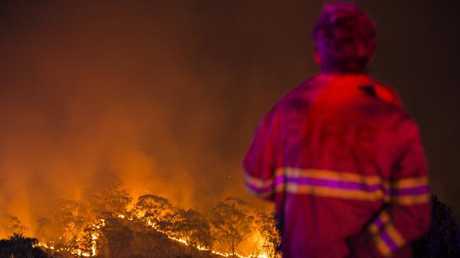 SOUTHWEST Sydney residents have endured a second nervous night as hundreds of firefighters took advantage of easing conditions to battle a blaze that's so far blackened 2500 hectares. 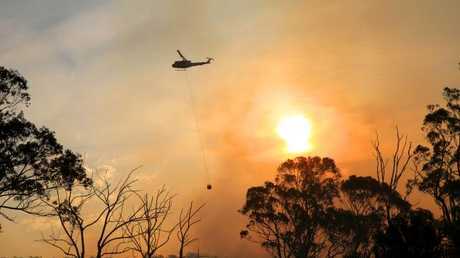 The fire, which began on Saturday afternoon and may have been deliberately lit, was fanned by strong winds on Sunday and approached suburban streets. 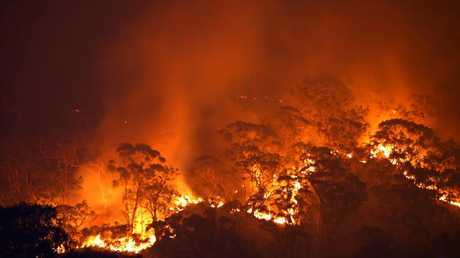 The blaze was downgraded from emergency level to watch and act about 5.30pm on Sunday as conditions began to ease. Early this morning it was downgraded again to Advice. Firefighters have taken advantage of the conditions to do a back burn along Heathcote Road near Pleasure Point as well as in areas of the Holsworthy military base. While the threat has eased, residents in the areas of Voyager Point, Pleasure Point, Sandy Point, Alfords Point, Barden Ridge, Illawong, Menai and Bangor should continue to monitor the situation and be prepared to activate their bush fire survival plans should conditions change. Heathcote Road remains closed between Macarthur Drive and New Illawarra Road. Old Illawarra Road at Barden Ridge has reopened. A large number of firefighters remain on the ground working to slow the spread of the fire, which continues to burn in a south-easterly direction towards Barden Ridge. Residents in the suburbs of Voyager Point, Pleasure Point, Sandy Point and Illawong, Menai and Bangor were warned of the danger of ember attacks as many scrambled with hoses and buckets to protect their houses. By 5pm, some Menai residents were starting to relax. Daniel Borg, who lives on Hall Drive in Menai alongside bushland, admitted it was concerning to see how close the flames came. "It was pretty scary," he told AAP when finally opening a beer, thankful his house came with sprinklers on the roof. 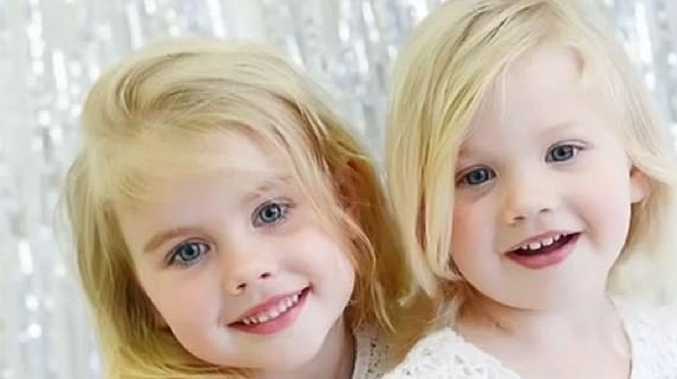 NSW Police on Sunday evening announced a task force had been set up to investigate whether the fire, which began in the vicinity of Leacocks Reserve in Casula, was deliberately lit. 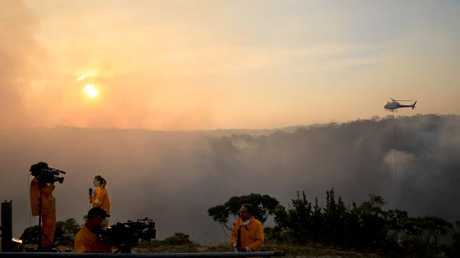 Conditions are expected to aid the firefighting effort today with winds about half the strength they were on Sunday. The temperature may remain a cause for concern, according to the RFS Deputy Commissioner Rob Rogers. "Still quite a difficult day ahead (on Monday)," he told the Nine Network. "I think we've got a long way to go before we're out of the woods." 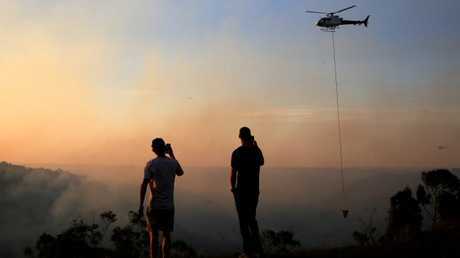 Residents in Voyager Point, Pleasure Point, Sandy Point, Alfords Point, Barden Ridge, Illawong, Menai and Bangor were told to be prepared to activate their bushfire survival plans should conditions change. Heathcote Road remains closed between Macarthur Drive and New Illawarra Road while Old Illawarra Road at Barden Ridge has reopened.